Mark Montgomery is perfect...until she time travels into it. Mark is a slacker content with his life. He's a senior at New Haven Prep, has a great friend, and after graduation he'll get a brand new sports car from his parents, assuming he stays out of trouble. Then, she comes into his life--Miranda with her I-just-escaped-from-a-Renaissance-Fair clothing. Only, she hasn't. She has come from Bodiam Castle in the Middle Ages and demands a secret ingredient and a book of recipes for traveling through the treacherous colors of time. Although Mark has never even heard of either before, he must find them, or Miranda will die. To save her, Mark must break into a psych hospital to visit his grandfather who once tried to kill him, pass through the colors of time, take on a medieval alchemist, prevent Miranda's marriage to a two-timing baron, and keep it all hidden from his parents. The sports car is definitely in trouble. The first three chapters of the novel are included in this sample of the book. C. M. Keller is an award winning novelist and the author of SCREWING UP TIME, SCREWING UP BABYLON, and SCREWING UP ALEXANDRIA. She loves old movies and poison rings. In her spare time, she searches for that elusive unicorn horn. She’s currently hard at work on her next YA novel, the third book in Mark and Miranda’s story. 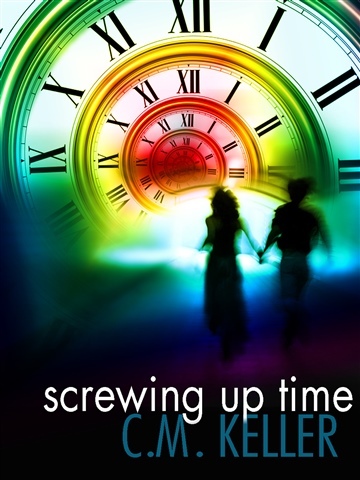 Screwing Up Time is a 2012 Amazon Breakthrough Novel Award Quarterfinalist.